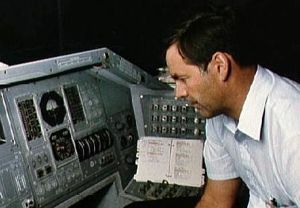 American test pilot astronaut 1980-1994. Flew 200 combat missions over Vietnam. Status: Inactive; Active 1980-1994. Born: 1945-06-13. Spaceflights: 4 . Total time in space: 26.15 days. Birth Place: New York, New York. PERSONAL DATA: Born June 13, 1945, in New York, New York. Married to the former Lynn O'Keefe of Ottawa, Canada. Ron has two daughters and he and Lynn have a son. Recreational interests include skiing, wind surfing, and racquet sports. EDUCATION: Graduated from Stuyvesant High School, New York, New York, in 1962, received a bachelor of science degree in engineering science from the United States Air Force Academy in 1966; studied aeronautics as a Fulbright Scholar at the Technische Hochschule, Darmstadt, West Germany, in 1967. SPECIAL HONORS: The Air Force Distinguished Flying Cross, the Air Medal with 7 Oak Leaf Clusters, the Air Force Meritorious Service Medal, the Liethen-Tittle Award (for Outstanding Student at the USAF Test Pilot School), the Royal Air Force Cross, the NASA Exceptional Service Medal, and NASA Space Flight Medals. EXPERIENCE: Upon graduating from the Air Force Academy in 1966, Grabe went to Darmstadt, West Germany, as a Fulbright Scholar. He returned to the States in 1967 to complete pilot training at Randolph Air Force Base, Texas. He subsequently flew F-100 aircraft with the 27th Tactical Fighter Wing at Cannon Air Force Base, New Mexico, and in 1969 was assigned as an F-100 pilot with the 3d Tactical Fighter Wing at Bien Hoa Air Base in the Republic of Vietnam where he flew 200 combat missions. In 1970, he was reassigned to the 27th Tactical Fighter Wing at Cannon Air Force Base to fly F-100 and F-111 aircraft. He participated in the operational test and evaluation of the weapons system of the F-111D aircraft. Grabe attended the USAF Test Pilot School in 1974 and, upon graduating in 1975, was assigned to the Air Force Flight Test Center as a test pilot for the A-7 and F-111. He was the program manager and chief project pilot for the Air Force's digital flight control system for tactical fighters (DIGITAC) evaluation. He later served as an exchange test pilot with the Royal Air Force at Boscombe Down, United Kingdom, from 1976 to 1979. During this tour of duty, he served as the chief project pilot for the Royal Air Force Harrier and the Royal Navy Sea Harrier. He was an instructor at the USAF Test Pilot School at Edwards Air Force Base, California, when advised of his selection by NASA. He has logged more than 5,500 hours flying time. NASA EXPERIENCE: Grabe became a NASA astronaut in August 1981. 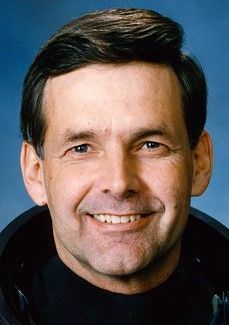 He has served as a chief verification pilot for STS-3 and STS-4 entry guidance, navigation and control simulation testing; as the Deputy Manager for Operations Integration, Space Shuttle Program Office; and subsequently as the Chief of Training within the Astronaut Office. A veteran of four space flights, Grabe served as pilot on STS 51-J (October 3-7, 1985) and STS-30 (May 4-8, 1989), and was the mission commander on STS-42 (January 22-30, 1992) and STS-57 (June 21 to July 1,1993). Grabe has logged over 627 hours in space. Effective April 11, 1994, Grabe left NASA and the Air Force to join Orbital Sciences Corporation, Dulles, Virginia. SPACE FLIGHT EXPERIENCE: STS-51J, the second Space Shuttle Department of Defense mission, launched from Kennedy Space Center, Florida, on October 3, 1985. This was the maiden voyage of the Atlantis, the final Orbiter in the Shuttle fleet. After 98 hours of orbital operations, Atlantis landed at Edwards Air Force Base, California, on October 7, 1985. Mission duration was 97 hours, 14 minutes, 38 seconds. STS-30 Atlantis launched from Kennedy Space Center, Florida, on May 4, 1989. During the four-day mission, the crew successfully deployed the Magellan Venus-exploration spacecraft, the first U.S. planetary science mission launched since 1978, and the first planetary probe to be deployed from the Shuttle. Magellan arrived at Venus in mid-1990, and mapped over 95% of the surface of Venus. Magellan has been one of NASA's most successful scientific missions and continues to operate today gaining information about the Venetian atmosphere and magnetic field. In addition, crew members also worked on secondary payloads involving fluid research in general, chemistry, and electrical storm studies. Following 64 orbits of the Earth, the STS-30 mission concluded with a landing at Edwards Air Force Base, California, on May 8, 1989. Mission duration was 96 hours, 57 minutes, 35 seconds. STS-42 Discovery launched from the Kennedy Space Center, Florida, on January 22, 1992. Fifty-five major experiments conducted in the International Microgravity Laboratory-1 module were provided by investigators from eleven countries, and represented a broad spectrum of scientific disciplines. During 128 orbits of the Earth, the seven-person crew accomplished the mission's primary objective of investigating the effects of microgravity on materials processing and life sciences. In this unique laboratory in space, the crew worked around-the-clock in two shifts. Experiments investigated the microgravity effects on the growth of protein and semiconductor crystals. Biological experiments on the effects of zero gravity on plants, tissues, bacteria, insects and human vestibular response were also conducted. This eight-day mission culminated in a landing at Edwards Air Force Base, California, on January 30, 1992. Mission duration was 193 hours, 14 minutes, 45 seconds. STS-57 Endeavour launched from the Kennedy Space Center, Florida, on June 21, 1993. The primary mission of this flight was the retrieval of the European Retrievable Carrier satellite (EURECA). Additionally, STS-57 featured the first flight of the Spacehab, a commercially provided middeck augmentation module for the conduct of microgravity experiments. Spacehab carried 22 individual flight experiments in materials processing and human factors. A spacewalk was conducted on this flight as part of an ongoing program to evaluate extravehicular activity (EVA) techniques for future missions. The Space Shuttle Endeavour landed at the Kennedy Space Center on July 1, 1993, after 10 days on orbit. Mission duration was 239 hours, 45 minutes. BIRTHPLACE AND DATE: Born June 13, 1945, in New York, New York. His mother, Mrs. Martha Grabe, resides in Lakewood, New Jersey. PHYSICAL DESCRIPTION: Brown hair; hazel eyes; 6 feet; 185 pounds. EDUCATION: Graduated from Stuyvesant High School, New York, New York, in 1962; received a bachelor of science degree in Engineering Science from the United States Air Force Academy in 1966; studied aeronautics as a Fulbright Scholar at the Technische Hochschule, Darmstadt, West Germany, in 1967. MARITAL STATUS: Married to the former Marijo A. Landon. Her parents, Mr. and Mrs. Jack N. Landon, reside in Clovis, New Mexico. CHILDREN: Hilary, December 25, 1974; and Alison, March 9, 1979. RECREATIONAL INTERESTS: He enjoys skiing, wind surfing, and racquet sports. EXPERIENCE: Upon graduating from the Air Force Academy in 1966, Grabe went to Darmstadt, West Germany, as a Fulbright Scholar. He returned to the United States in 1967, to complete pilot training at Randolph Air Force Base, Texas. He subsequently flew F-100 aircraft with the 27th Tactical Fighter Wing at Cannon Air Force Base, New Mexico, and in 1969 was assigned as an F-100 pilot with the 3d Tactical Fighter Wing at Bien Hoa Air Base in the Republic of Vietnam where he flew 200 combat missions. In 1970, he was reassigned to the 27th Tactical Fighter Wing at Cannon Air Force Base to fly F-100 and F-111 aircraft. He participated in the operational test and evaluation of the weapons system of the F-111D aircraft. Grabe attended the USAF Test Pilot School in 1974 and, upon graduating in 1975, was assigned to the Air Force Flight Test Center as a test pilot for the A-7 and F-111. He was the program manager and chief project pilot for the Air Force's digital flight control system for tactical fighters (DIGITAC) evaluation. He later served as an exchange test pilot with the Royal Air Force at Boscombe Down, United Kingdom, from 1976 to 1979. During this tour of duty, he served as the chief project pilot for the Royal Air Force Harrier and the Royal Navy Sea Harrier. He was an instructor at the USAF Test Pilot School at Edwards Air Force Base, California, when advised of his selection by NASA. NASA EXPERIENCE: Grabe became a NASA astronaut in August 1981. He served as chief verification pilot for STS-3 and STS-4 entry guidance, navigation and control simulation testing, as the Deputy Manager for Operations Integration, Space Shuttle Program Office, and subsequently as the Chief of Training within the Astronaut Office. Grabe was pilot for STS 51-J, the second Space Shuttle Department of Defense mission, which launched from Kennedy Space Center, Florida, on October 3, 1985. This was the maiden voyage of the Atlantis, the final Orbiter in the Shuttle fleet. After 98 hours of orbital operations, Atlantis landed on Edwards Air Force Base, California, on October 7, 1985. On his second mission, Grabe was pilot for STS-30, which launched from Kennedy Space Center, Florida, on May 4, 1989. On board the Orbiter Atlantis during this four day mission, crew members successfully deployed the Magellan Venus-exploration spacecraft, the first U.S. planetary science mission launched since 1978, and the first planetary probe to be deployed from the Shuttle. Magellan arrived at Venus in mid-1990, and using specialized radar instruments mapped the surface of Venus. In addition, crew members also worked on secondary payloads involving fluid research in general, chemistry and electrical storm studies. Following 64 orbits of the earth, the STS-30 mission concluded a landing at Edwards Air Force Base, California on May 8, 1989. More recently, Grabe was commander of the seven person STS-42 crew, aboard the Shuttle Discovery, which lifted off from the Kennedy Space Center, Florida, on January 22, 1992. Fifty five major experiments conducted in the International Microgravity Laboratory-1 module were provided by investigators from eleven countries, and represented a broad spectrum of scientific disciplines. During 128 orbits of the Earth, the STS-42 crew accomplished the mission's primary objective of investigating the effects of microgravity on materials processing and life sciences. In this unique laboratory in space, crew members worked around-the-clock in two shifts. Experiments investigated the microgravity effects on the growth of protein and semiconductor crystals. Biological experiments on the effects of zero gravity on plants, tissues, bacteria, insects and human vestibular response were also conducted. This eight-day mission culminated in a landing at Edwards Air Force Base, California, on January 30, 1992. With the completion of his third mission, he has logged over of 387 hours in space. CURRENT ASSIGNMENT: Colonel Grabe will command the crew of STS-57, which will carry the commercial middeck augmentation module called SPACEHAB, and will also retrieve the European Retrievable Carrier (EURECA). STS-57 is scheduled for launch in mid-1993. Family: Astronaut. Country: USA. Flights: STS-51-J, STS-61-G, STS-30, STS-42, STS-57. Projects: STS. Agency: USAF. Bibliography: 12, 5456. 1945 June 13 - . Birth of Ronald John 'Ron' Grabe - . Nation: USA. Related Persons: Grabe. American test pilot astronaut 1980-1994. Flew 200 combat missions over Vietnam. 4 spaceflights, 26.2 days in space. Flew to orbit on STS-51J (1985), STS-30, STS-42, STS-57..
1980 May 19 - . NASA Astronaut Training Group 9 selected. - . Nation: USA. Related Persons: Bagian, Blaha, Bolden, Bridges, Chang-Diaz, Cleave, Dunbar, Fisher, William, Gardner, Guy, Grabe, Hilmers, Leestma, Lounge, O Connor, Richards, Ross, Smith, Spring, Springer. 1985 October 3 - . 15:15 GMT - . Launch Site: Cape Canaveral. Launch Complex: Cape Canaveral LC39A. Launch Platform: MLP2. LV Family: Shuttle. Launch Vehicle: Space Shuttle. STS-51-J - . Call Sign: Atlantis. Crew: Bobko, Grabe, Hilmers, Pailes, Stewart. Payload: Atlantis F01 / DSCS-3 2 / DSCS-3 3 [IUS]. Mass: 115,900 kg (255,500 lb). Nation: USA. Related Persons: Bobko, Grabe, Hilmers, Pailes, Stewart. Agency: NASA Houston. Program: STS. Class: Manned. Type: Manned spaceplane. Flight: STS-51-J. Spacecraft Bus: Shuttle. Spacecraft: Atlantis. Duration: 4.07 days. Decay Date: 1985-10-07 . USAF Sat Cat: 16115 . COSPAR: 1985-092A. Apogee: 486 km (301 mi). Perigee: 476 km (295 mi). Inclination: 28.50 deg. Period: 94.20 min. Manned five crew. Atlantis (first flight); deployed USA 11, USA 12. Reusable space transportation system. Orbits of Earth: 63. Landed at: Runway 23 dry lake bed at Edwards Air Force Base, . Touchdown miss distance: 754.00 m. Landing Rollout: 2,455.00 m. Payloads: Classified DoD Mission - Record altitude (as of 5/93). 1985 October 7 - . Landing of STS-51-J - . Return Crew: Bobko, Grabe, Hilmers, Pailes, Stewart. Nation: USA. Related Persons: Bobko, Grabe, Hilmers, Pailes, Stewart. Program: STS. Flight: STS-51-J. STS-51-J landed at 17:07 GMT. .
STS-61-G (cancelled) - . Crew: Grabe, Thagard, van Hoften, Walker, Dave. Payload: Galileo. Nation: USA. Related Persons: Grabe, Thagard, van Hoften, Walker, Dave. Program: STS. Flight: STS-61-G. Spacecraft Bus: Shuttle. Spacecraft: Atlantis. Planned shuttle mission for deployment of Galileo spacecraft. Cancelled after Challenger disaster. .
1989 May 4 - . 18:47 GMT - . Launch Site: Cape Canaveral. Launch Complex: Cape Canaveral LC39B. Launch Platform: MLP1. LV Family: Shuttle. Launch Vehicle: Space Shuttle. STS-30 - . Call Sign: Atlantis. Crew: Cleave, Grabe, Lee, Thagard, Walker, Dave. Payload: Atlantis F04 / Magellan [IUS]. Mass: 20,833 kg (45,928 lb). Nation: USA. Related Persons: Cleave, Grabe, Lee, Thagard, Walker, Dave. Agency: NASA Houston. Program: STS. Class: Manned. Type: Manned spaceplane. Flight: STS-30. Spacecraft Bus: Shuttle. Spacecraft: Atlantis. Duration: 4.04 days. Decay Date: 1989-05-08 . USAF Sat Cat: 19968 . COSPAR: 1989-033A. Apogee: 366 km (227 mi). Perigee: 361 km (224 mi). Inclination: 28.90 deg. Period: 91.80 min. Manned five crew. Deployed Magellan Venus probe. Payloads: Deploy IUS with Magellan spacecraft. Fluids Experiment Apparatus (FEA). Mesoscale Lightning Experiment (MLE), Air Force Maui Optical Site (AMOS) experiment..
1989 May 8 - . Landing of STS-30 - . Return Crew: Cleave, Grabe, Lee, Thagard, Walker, Dave. Nation: USA. Related Persons: Cleave, Grabe, Lee, Thagard, Walker, Dave. Program: STS. Flight: STS-30. STS-30 landed at 19:40 GMT. .
1992 January 22 - . 14:52 GMT - . Launch Site: Cape Canaveral. Launch Complex: Cape Canaveral LC39A. Launch Platform: MLP3. LV Family: Shuttle. Launch Vehicle: Space Shuttle. STS-42 - . Call Sign: Discovery. Crew: Bondar, Grabe, Hilmers, Merbold, Oswald, Readdy, Thagard. Payload: Discovery F14 / GBA-3. Mass: 13,001 kg (28,662 lb). Nation: USA. Related Persons: Bondar, Grabe, Hilmers, Merbold, Oswald, Readdy, Thagard. Agency: NASA Houston. Program: STS. Class: Manned. Type: Manned spaceplane. Flight: STS-42. Spacecraft Bus: Shuttle. Spacecraft: Discovery. Duration: 8.05 days. Decay Date: 1992-01-30 . USAF Sat Cat: 21846 . COSPAR: 1992-002A. Apogee: 307 km (190 mi). Perigee: 291 km (180 mi). Inclination: 57.00 deg. Period: 90.50 min. Manned seven crew. Carried International Microgravity Laboratory-1. Payloads: International Microgravity Laboratory (lML)-1, getaway special (GAS) bridge with 10 getaway specials, IMAX camera, Gelation of Sols: Applied Microgravity Research (GOSAMR)-1, Investigations Into Polymer Mem-brane Processing (IPMP), Radiation Monitoring Equipment (RME)-lll, Student Experiment 81-09: Convection in Zero Gravity, Student Experiment 83-02: Capillary Rise of Liquid Through Granular Porous Media. 1992 January 30 - . Landing of STS-42 - . Return Crew: Bondar, Grabe, Hilmers, Merbold, Oswald, Readdy, Thagard. Nation: USA. Related Persons: Bondar, Grabe, Hilmers, Merbold, Oswald, Readdy, Thagard. Program: Spacelab. Flight: STS-42. STS-42 landed at 16:07 GMT. .
1993 June 21 - . 13:07 GMT - . Launch Site: Cape Canaveral. Launch Complex: Cape Canaveral LC39B. Launch Platform: MLP2. LV Family: Shuttle. Launch Vehicle: Space Shuttle. STS-57 - . Call Sign: Endeavour. Crew: Currie, Duffy, Grabe, Low, Voss, Janice, Wisoff. Payload: Endeavour F04 / GBA-5. Mass: 8,931 kg (19,689 lb). Nation: USA. Related Persons: Currie, Duffy, Grabe, Low, Voss, Janice, Wisoff. Agency: NASA Houston. Program: STS. Class: Manned. Type: Manned spaceplane. Flight: STS-57. Spacecraft Bus: Shuttle. Spacecraft: Endeavour. Duration: 9.99 days. Decay Date: 1993-07-01 . USAF Sat Cat: 22684 . COSPAR: 1993-037A. Apogee: 471 km (292 mi). Perigee: 402 km (249 mi). Inclination: 28.50 deg. Period: 93.30 min. Manned six crew. Carried Spacehab 1; retrieved Eureca-1 spacecraft. Payloads: Spacehab 01, retrieval of European Retriev-able Carrier (EURECA) Satellite, Superfluid Helium On-Orbit Transfer (SHOOT), Consortium for Materials Development in Space Complex Autonomous Payload (CONCAP)-IV, Fluid Acquisition and Resupply Experiment (FARE), Shuttle Amateur Radio Experiment (SAREX) II, Air Force Maui Optical Site (AMOS), GAS bridge assembly with 12 getaway special payloads. 1993 July 1 - . Landing of STS-57 - . Return Crew: Currie, Duffy, Grabe, Low, Voss, Janice, Wisoff. Nation: USA. Related Persons: Currie, Duffy, Grabe, Low, Voss, Janice, Wisoff. Flight: STS-57. STS-57 landed at 12:51 GMT. .